Aside from all the help and support you’ve given me regarding my own work, I know so little about you. Would you mind sharing a little about your background? Where are you from? How did you and your partner/husband Tom Phipps get started in writing? Have you always written fantasy? 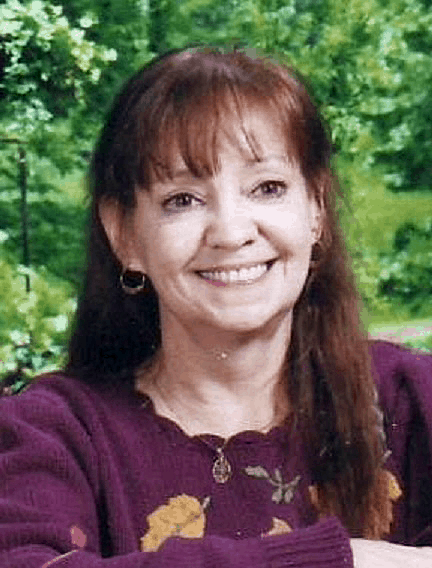 Carol Marrs Phipps – I am a mother, grandmother, wife and doting pet owner. I say this first because my husband is always telling me that if I didn’t have anything else, I would mother a rock Apparently my students agreed with my husband, because when I still taught elementary school, many of them often referred to me as “mom” rather than Mrs. Phipps. My pets include six cats, a cockatiel, a raven and a blue-fronted Amazon parrot. (Though, anyone who has ever hand-raised a parrot understands they are far more like having another child, than a pet, particularly if they talk). I also love the outdoors where I enjoy walking, hiking, swimming, biking and picnics in the woods. Movies, traveling and family get-togethers are also an important part of my life. I was born and began life in Trenton, Missouri, but my parents moved to Illinois when I was very young. 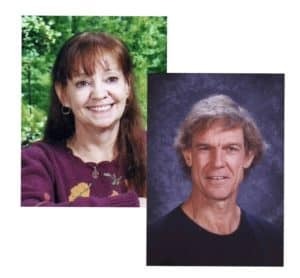 My husband Tom and I lived in the Southwest (Arizona, New Mexico and Nevada) where we taught on a number of Native American Reservations until we decided to move back to Illinois. Carol Marrs Phipps – I haven’t taught since our return, concentrating on our writing instead. Tom is retired from teaching, but now has a part time job (three 12 hr, days a week). I am a fantasy writer and a dreamer. I love to weave the visions which play out in my imagination into fantastic tales for my own amusement and the enjoyment of others. If not writing I am a voracious reader. I had a number of short stories I had written for my creative writing classes and the yearly anthology which I read to my husband and step children. Tom was impressed by my writing and encouraged me to take it up again. Since writing had always been my first career choice, I was easy to convince. However, I discovered along the way that Tom also had a great writing talent, though he was more of a non-fiction writer. We soon decided that combining our skills would make some realistic fantasy stories that all ages could read and enjoy. Thus, we became a team. I just finished Elf Killers and like with WHAM!, could not stop reading. My only pause in the book was trying to decipher the troll language. That is until I found the glossary. Big help, by the way! Thanks for adding it. How did you come upon the troll language or was this something you created? Carol Marrs Phipps – Yes…and, no. As I mentioned earlier, Tom and I spent the bulk of our teaching careers on the Native Indian Reservations. The troll language evolved out of native Navajo…with some creative adjustment, mostly exchanging one consonant for another. The word meanings, however, remained the same for our book. Regarding Elf Killers, your world creation was highly detailed, your adventure compelling and fast paced, and your characters so fun to read, I absolutely lost myself in the book. Su ch an amazing story. Is Elf Killers a standalone novel or do you plan a sequel? Carol Marrs Phipps – Again I must answer yes…and no to your question. Although ELF KILLERS is our first published work, it was not actually written first. Tom and I had written four or five of the HEART OF THE STAFF books before we decided to do ELF KILLERS. In STONE HEART, the 3rd book of the HEART OF THE STAFF series, the elf killer trolls are actually introduced, and they appear in each book of the series thereafter. ELF KILLERS is more or less a prelude to the series, even though it is not so labeled. Most of the trolls and elves from the series appear in ELF KILLERS, too. Then in WHAM! the readers who have read ELF KILLERS and/or the HEART OF THE STAFF series will discover in book 2 of the TIMEWALKER series, that the troll barber is a descendant of Thunderman Veyfnaryr. Yes…all of our books are “connected”. WHAM!, book 1 of the TIMEWALKER series takes place 700 years after the HEART OF THE STAFF series, but you’ll find some of those “eternal” fairies and long-lived elves cropping up from time to time. 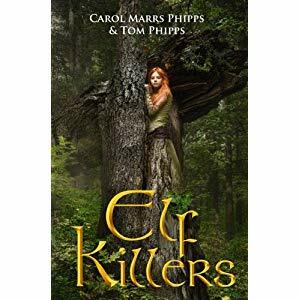 Carol Marrs Phipps – Fantasy is my answer to both questions. Regarding your series, Heart of the Staff, please tell us a little about it? 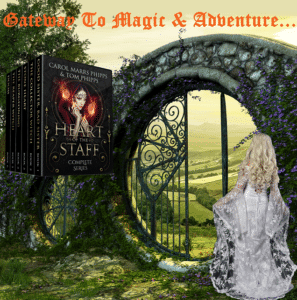 Carol Marrs Phipps – The HEART OF THE STAFF series is a true epic fantasy saga which spans four complete generations in the life of a wizarding family. Two evil sorceresses are on a path to rule the entire world; one from the shadows and the other from the throne she “inherited” early by killing her adoptive parents, the former king and queen, shortly after her sixteenth birthday. The wizarding family, headed by the most powerful wizard in the land, Razzmorten Dewin , who had previously lived in a peaceful, even idyllic land, now find themselves and their very world in great peril. Many thanks to Author Carol Marrs Phipps for joining us! I have long admired her marketing efforts on Twitter, creating these elaborate detailed and colorful posters. Click on this pic and get a great Christmas Wonderland Surprise! For more on Carol’s great new venture, stay tuned for next week’s post! Thank you so much for having me here today on your amazing blog, Ingrid. It has been an honor. Thank you, Carol! I thoroughly enjoyed interviewing you. Thanks, Pearl, I always appreciate your feedback! Hello Ingrid! What a fascinating interview! I enjoyed reading all about Carol and her work. I have a couple of her books in my Kindle and look forward to reading them. Thank you!